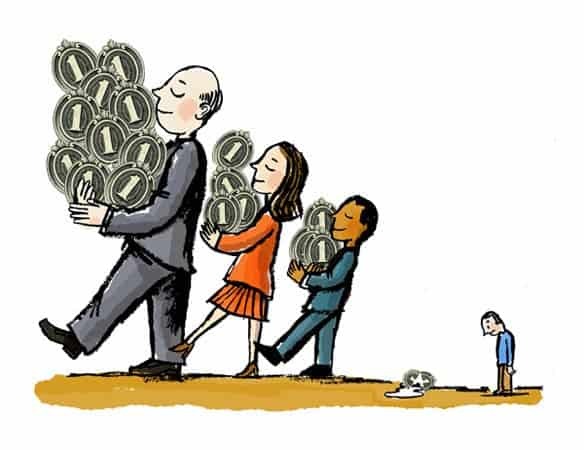 United States, income inequality, or the gap between the rich and everyone else, has been growing markedly, by every major statistical measure, for some 30 years. After WWII and up to the late 1970s, this gap markedly decreased. In other words, incomes at the bottom were rising faster than those at the top. Since the late 1970s, this trend has reversed to the point that the top 1 percent share of national income peaked at 23.5 percent. 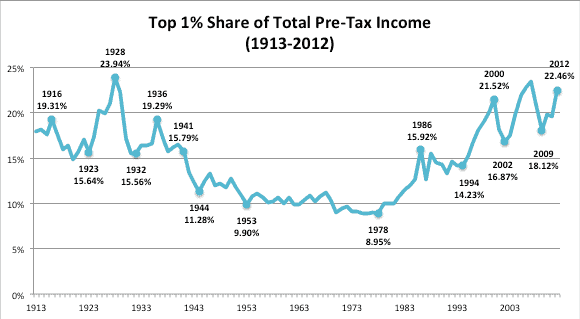 The only other year since 1913 that the wealthy had claimed such a large share of national income was 1928. Richard Wilkinson, Professor Emeritus of Social Epidemiology at England’s University of Nottingham, argues in his book about income inequality, The Spirit Level, that social ills, like crime and teen pregnancy, that have long been associated with poverty, actually have a stronger correlation with income inequality. The absolute worst effect of income inequality, however, is that it destroys social mobility. Basically, it kills the American dream. Really, if you want to live the American dream today…. move to a Scandinavian country. 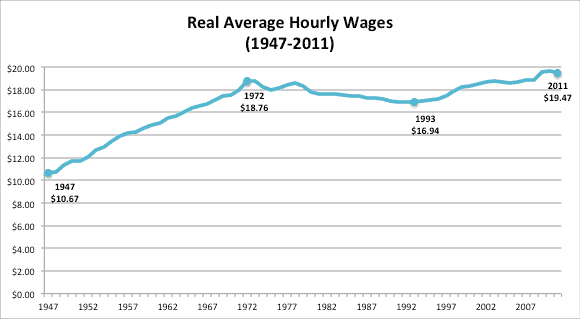 Source: Economic Policy Institute, “Wages and Compensation Stagnating,” 2011, based on Bureau of Labor Statistics data. Figures are for production and non-supervisory workers. 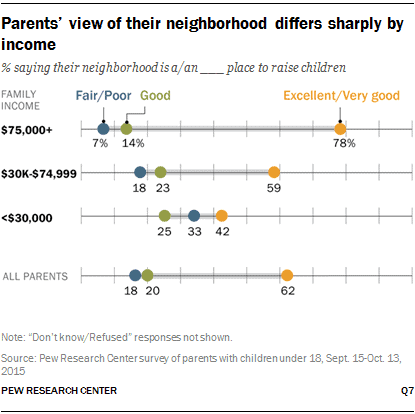 Higher-income parents are nearly twice as likely as lower-income parents to rate their neighborhood as an “excellent” or “very good” place to raise kids (78% vs. 42%), but a third of parents with annual family incomes less than $30,000 say that their neighborhood is only a “fair” or “poor” place to raise kids; just 7% of parents with incomes in excess of $75,000 give their neighborhood similarly low ratings. Among parents, affluent or otherwise, the main concern is bullying. For second place, however, things seriously start to fork. 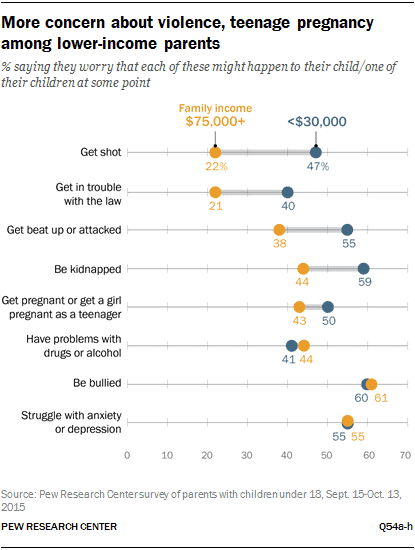 Well off parents 2nd greatest worry is their children being depressed or anxious, while nearly half of low-income parents worry their child will get shot. The new Pew study, however, is most insightful in its analysis of extracurricular activities. Of families which earn more than $75,000 a year, 84 percent say their children have participated in organized sports over the past year, 64 percent have done volunteer work and 62 percent have taken lessons in music, dance or art. Of families earning less than $30,000, 59 percent of children have done sports, 37 percent have volunteered and 41 percent have taken arts classes. Parents with higher incomes are also more likely to say their children’s day-to-day schedules are too hectic with too many things to do. Overall, 15% of parents with children between ages 6 and 17 describe their kids’ schedules this way. Among those with incomes of $75,000 or higher, one-in-five say their children’s schedules are too hectic, compared with 8% of those who earn less than $30,000. White parents are far more likely than black parents to worry that their kids might struggle with anxiety or depression (58% vs. 35%) or that they might have problems with drugs or alcohol (40% vs. 23%), the Pew study shows. Black parents, in turn, worry more than white parents do that their children might get shot at some point. About four-in-ten (39%) black parents say this is a concern, compared with about one-in-five (22%) white parents. Both low-income and high-income parents love their children and want the best for them. Yet, when you’re poor and have to work two jobs, there’s little time left for child rearing or money to send kids to piano lessons or dancing. Seventy-one percent of parents with a college degree say they read aloud to their toddlers, compared with 33 percent of those with a high school diploma or less. Income inequality means segregation, which means poor people stay in poor neighborhoods where crime is more rampant and opportunities for social mobility less pronounced. And so on in an endless cycle, unless we do something about it.